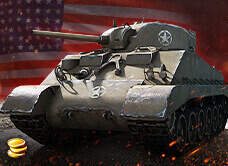 For this week’s Collector’s Gem, we have a tank that’s been hard to come by all this time: the M4A2E4! This vehicle was previously awarded to players who managed to fight in at least 1,000 battles during Closed Beta Testing. The M4A2E4 was an experimental medium tank, for which two prototypes were built in July 1943. Although the vehicle passed trials, it was never mass-produced or used in combat. The M4A2E4 is a variant of the M4 Sherman, with several differences in design. It has heavier armour than the M4, and sports straighter angles for better deflection of incoming rounds. It also balances well between mobility and firepower, enabling it to engage and defeat most light and medium tanks. This vehicle will be available in the Premium Shop from from 09th October 2015 to 12th October 2015 in a special weekly bundle, which includes 11,000 , a free garage slot, and the vehicle itself. Tank collectors who have always wanted one but haven’t been able to get your hands on one, this is your chance to get it easily! When using the M4A2E4, make full use of its advantages: good mobility, high view range, high rate of fire, and strong frontal armour. Bounce incoming shots, then ride around your opponents and tear them apart. Its main gun performs well against light and medium tanks, but tends to perform poorly against heavy tanks, especially in higher tiers. When facing heavy tanks, be cautious and play as a support rather than facing the enemy by yourself. All the above traits, combined with preferential matchmaking, make the M4A2E4 a strong contender in any battle, especially when it is top-tier. Visit the Premium Shop to get yours now!